Steve Kinniburgh is expecting his Corby Town team to come out firing this weekend, despite them having to kick their heels last Saturday. 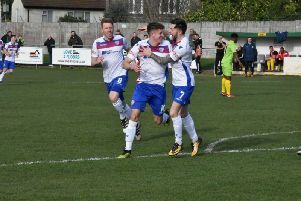 The Steelmen’s Evo-Stik League South Division One Central clash at Barton Rovers was one of a number of matches that fell victim to the weather. With Corby and leaders Peterborough Sports inactive, second-placed Bromsgrove Sporting took advantage to move to within a point of Sports and four clear of the Steelmen with a 6-3 win at Yaxley. Both Corby and Sports now have three games in hand on Sporting as the battle for the sole automatic promotion place heats up. And, despite the weather robbing them of the chance to maintain their momentum last weekend, Kinniburgh said: “I don’t think it will affect us. “As a team, as a squad, there is a good understanding of what we want to achieve this year and the way we go about that is not going to change no matter the circumstances. “We are going into the last 15 games and it’s all about getting it done. “We are heading into a period towards the end of this month where we will have a run of Saturday-Tuesday-Saturday-Wednesday and after that, it will give us the real picture of where we are and what will need to be done at the business end of the season.